Elimination Diets: Are They Really Helpful? Elimination diets are really popular these days. They are often prescribed, recommended or adopted as a way to treat digestive issues, symptoms of inflammation, auto-immune diseases, mental health concerns, hormone imbalances and migraines to name a few. While I understand that nutrition isn’t one size fits all, these types of protocols often recommend so many unnecessary, non-evidenced based restrictions. Is There a Downside to the Clean Eating Trend? Elimination diets are a fantastic example of diet culture disguised as health. We’ve learned to equate healthy eating with restrictive eating, so what starts out as an innocent goal of making more nutritious food choices can easily be a slippery slope into disordered eating. Being so hyper focused on following the rules can easily cause preoccupation and paralyzing fear of the so-called offending foods. If you’ve been there, you know what I mean. Trying to add back the foods you’ve been told are hurting you takes tremendous strength and bravery after avoiding them for so long. There is a deep level of guilt and tremendous feeling of failure when you eat these foods that have been described as damaging, harmful or poisonous. That reaction is understandable, but hugely problematic and a very good reason to avoid the elimination process in the first place. So, if you are considering implementing an elimination diet, I want to give you a list of things to consider beforehand. The whole is greater than the sum of it’s parts. Nutrients in food work in synergy, which has far more to do with creating health and wellbeing than any one food or food group individually. Breaking food down in the way that elimination diets do is a great example of reductionist thinking, which isn’t at all helpful given the complex interplay of nutrition. If you are concerned about physical symptoms, try taking a step back and look at meal and snack patterns as a whole instead of blaming one particular food, food group or food ingredient. Are you eating consistently and regularly? Are meals and snacks balanced in a way that is nourishing, adequate and satisfying? This is where seeing a dietitian can be super helpful. If what you are doing for your physical health is negatively impacting your mental, emotional or social health, it’s not healthy anymore. It’s essential that you consider the impact elimination diets can have on your overall wellbeing, and quite often they lead to greater preoccupation with food rules, greater emotional distress when life gets in the way of your diet, and isolation from social interaction particularly when food is involved. It’s OK to decide it’s not worth it, because it usually isn’t. Don’t put all your eggs in the food basket. Health and wellbeing isn’t just about what you are eating, and other things can play a role in how you feel. Some items that come to mind would be stress, sleep, relationships and physical activity. In fact, the stress of following an elimination diet could cause more symptoms than the food itself. 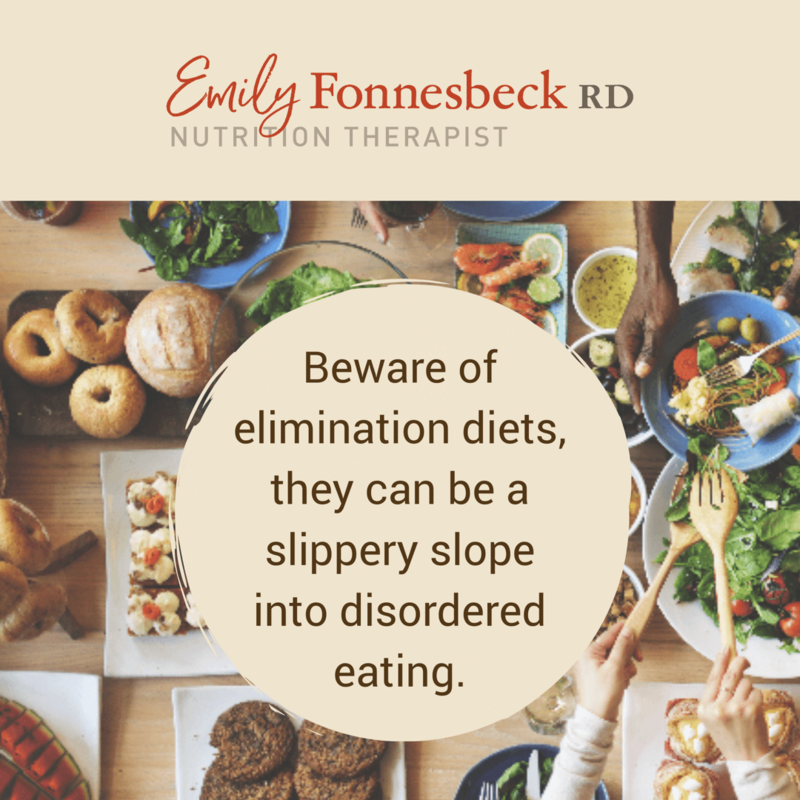 Lastly and most importantly, if you are in recovery for an eating disorder or have struggled with an eating disorder in the past, elimination diets are NOT for you. A very high percentage of individuals with an eating disorder also have a functional gut disorder, which may make you feel like an elimination diet could be helpful. I assure you that it’s not and there are ways to support digestive function while also supporting recovery (WITHOUT any food restrictions). Additionally, if you struggle with compulsive eating, you may feel the need to restrict certain foods or place rules around them. This will only increase their allure and exacerbate the problem. Full permission to eat all foods is essential to making peace with food, which includes feeling and behaving less impulsively. Discuss any concerns with your treatment team, and let them support you in doing the very hard work of embracing ALL foods. I sincerely hope this list has given you added perspective to assess your need for an elimination diet. While they may appear harmless and innocent, I hope you’ll take some time to consider possible side effects before jumping in. I would love to hear your thoughts! Are you a competent eater? Here’s how to tell.